Fundulus notatus has an elongated body with an upturned, terminal mouth, and a rounded caudal fin. They have large eyes, and the top of their head appears to be flattened. They have a prominent black stripe that spans from their head to their tail, and males can be distinguished by the vertical projections from their black stripe (5). Large, round scales cover the top of the head, the gill covers, and the cheeks, and an opal colored spot on top of the head is visible in living fish (4). 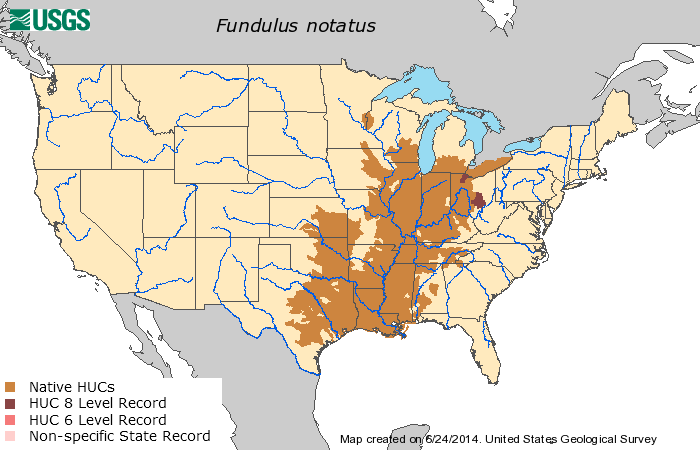 Fundulus notatus spawns in the late spring and during the summer. They are obligate plant spawners, and their eggs adhere to plants through an egg envelope. Females can produce roughly 20 to 30 eggs in a short amount of time. Once the eggs are laid, it takes them about 7 to 21 days to hatch, though the average hatching time is 10-14 days (2). The average lifespan for a Blackstripe Topminnow is around 3 years, and they grow to an average size of about 2 to 3.5 inches (2). These fish tend to live in small groups or pairs, and are most active in the morning and the evening when they are feeding. This fish will eat snails, terrestrial insects, microcrustaceans, aquatic insects, and algae (3). Blackstripe Topminnows swim along the top of the water so that they can grab insects of the surface of the water, and their upturned mouths aid in catching prey off the surface (4). If you skip to 52 seconds on the movie (the one on the left) you can see a quick flash of how Blackstripe Topminnows feed. 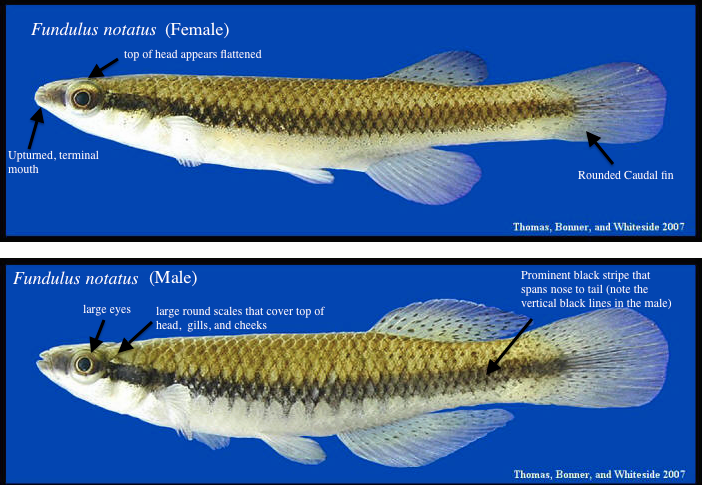 The International Union for Conservation and Nature (IUCN) lists the Blackstripe Topminnow as being a species of least concern. This is because they occur in many places, have large population sizes that are relatively stable, have a large number of subpopulations, and they are not currently being threatened by anything (7). Blackstripe Topminnows swim near the top of the water column because there is more oxygen present near the surface. This trait allows them to survive in water with low oxygen levels (6). 6. Fuller, B.; and Welsh, D. (Eds.). (2014). IB 463 Laboratory Manual. Urbana, IL.